At this sold out event, GABC Members were invited to an intimate Kamingespräch (fireside chat) with Dr. Ralf Horlemann, German Consul General to New England. The discussion topic was “Status Quo and Prospects of Transatlantic Relations” and our group was hosted in the gracious home of a Munich native in Newton Centre, MA. The guests went home enriched with deep thoughts and new insights after an evening of good food and wine, and stimulating conversation. Consul General Horlemann spoke about the vital importance of the transatlantic relationship and how it may evolve in times of a changing global order. He also addressed the challenges facing the European Union and the role of Germany both in the reform of the EU and the development of the relationship to the U.S.
Dr. Horlemann has served Germany’s Foreign Service for more than two decades and has a rich experience in international security policy, transatlantic relations and Asian affairs. 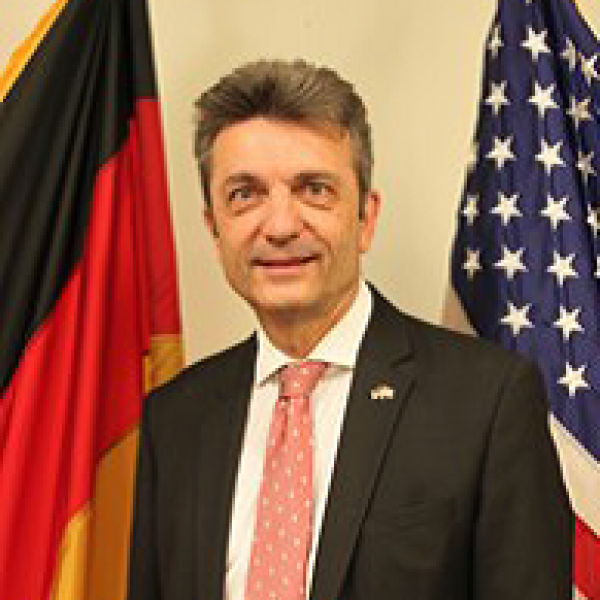 He took up his position as Consul General of Germany to New England in July 2015. During various assignments at headquarters and abroad, Dr. Horlemann has made major contributions to formulating and developing Germany’s policy in conflict prevention and management. Between 1998 and 2002 he was instrumental in founding the Berlin Center for International Peace Operations (ZIF) and most recently played an important role in further developing ZIF to a fully-fledged deployment organization for civilian experts in international peace operations. Dr. Horlemann has also worked on Asian affairs on several occasions over the past 20 years, including as Consul in Hong Kong and Head of the German Interest Section to Pyongyang, North Korea, as well as during various postings to the Federal Foreign Office, where he covered East and South Asian Affairs. From 2002 to 2005 he was responsible for Transatlantic Relations and Asian Affairs as Counselor to the German Embassy in Washington, D.C.